The folks at the KWGB Rhythm Jamboree Bandwagon out of Goodland, Kansas might look a bit familiar to you. For the most part, they're the same gang that appeared on the WGY Radio Ranch show out of Schnectady, New York around 1953 - 1954 at least. 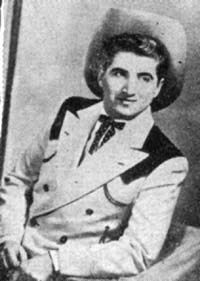 A Cowboy Songs article from 1954 made it sound as though Ernie and the gang were first at KWGB then went to WGY. 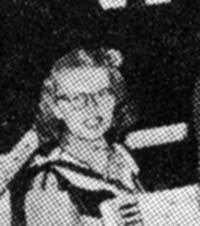 But here in an article in 1957, we find they're at KWGB in Kansas but without Ernie and Candy Lindell. The show appears to have been on both television and radio out of Goodland, Kanas. On tv, it was over Channel 10. During the week, the gang would do personal appearances far and wide in the surrounding states, from Dodge City, Kansas to as far away as Cheyenne, Wyoming. The cast has some similarities to the gang we saw at WGY, but also had some changes, too. Stan Fish, a top hawaiian steel guitar player was with them. In this article, we found that he was formerly a part of Hal "Lone Pine" and Betty Cody's recordings on RCA Victor and Robin Records. A new face in the gang was Jim Jarose who was known to be a radio announcer and disc jockey at KWGB, he took on the role of a comedian known as "Crazy Waldo" on the show. He was known for his ad-libs. He could also sing a decent tune they said. A husband-wife duo of Marion and Bob Heck were on the show. Marian was formerly Marion Bruno when they were on WGY. They got married while they were with Ernie Lindell's group back east. Marion was from Connecticut, Bob was from New York. 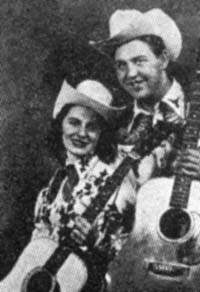 And still another husband-wife duo we find as part of this gang - Helen Fish, Stan Fish's wife, was also part of the group at this time and played the accordion. She didn't sing or rather they didn't know she could sing until as luck often happens, they had an opening on a show and they asked her to sing a tune. Finally there was Tommy Reilly, who they described as a big Irish cowboy, standing about six feet tall. He played guitar, doing his own arranging on his solo numbers and was a singer who 'made the teenagers swoon'. He also took part in the trio numbers with Bob and Marion Heck.